Myth #1 Floors and stove tops are the most unsanitary surfaces in your kitchen! FALSE While kitchen floors and stovetops are undoubtedly grimy, the surfaces most likely to spread food borne illnesses are your sink and sponge—which are used for everything from scrubbing raw chicken juice off cutting boards to rinsing E. coli and other germs from Romaine lettuce leaves. The problem is that most people don’t pause to properly clean and disinfect their cleaning tools and basins, essentially creating the perfect environment for your germs to thrive and multiply. Your sponge and kitchen drain stink because they’re home to a breeding, farting, germ jamboree! How do you shut down their microscopic fun? Clean, dry, and disinfect. Germs hate dry, clean surfaces as it literally starves them to death, so throw your sponge through the washer and dryer. Better yet, trade in your sponges for washable/re-usable dish rags. For your sink (unless otherwise indicated): at the end of each night, wash it with soap and water, then give it a final mist with a spray bottle of diluted bleach water (1 tsp bleach per quart). Germ party is over! Myth #2 You can clean stainless steel appliances with just polish! FALSE This feels like telling a child Santa isn’t real, but here we go: Your bottles of Stainless Steel Cleaner and Polish are lying to you. It doesn’t clean, at least not well. Legally, because the oils in the product do lubricate some dirt, they can technically call it a cleaner, but the truth is that it has no detergents or disinfectants to remove dirt and germs. Worse yet, the polymers and waxes in many of these products actually create a film that traps any dirt you have not removed…YUCK! Trapped oily dirt actually makes it easier for new dirt and germs to stick and grow on your appliance. Double YUCK! The solution? Clean before you polish! Especially for appliances in the kitchen that you are constantly touching with dirty, raw-meaty hands, it’s important to select a quality, disinfecting, all-purpose cleaner that is safe for stainless steel. Then, simply wash down the appliance. After it dries, buff in a small touch of polish like a hint of make-up to enhance the natural beauty of your stainless steel. As an added bonus, your pricy polish will now last a lot longer and save you money. Win Win! Myth #3 Your kitchen cabinets don’t need to be cleaned that often! FALSE We are frankly not sure why this misconception got so popular, as nothing could be further from the truth. Your cabinets, especially the handles, are some of the most frequently touched and unfairly neglected surfaces in your kitchen. Just think about how many times your sniffly child has rubbed his dripping nose and then opened the cabinet for a snack; or how many times mid-recipe you’ve yanked open a cabinet for one last ingredient with your raw-egg or meaty hands. We won’t even discuss your family’s overly speedy bathroom hand washers. Beyond germs, steam rising off your stovetop also carries oils and food particles that eventually coats all surrounding cabinets with a fine layer of sticky grime. Countertop fryers speed this process up tenfold. Long story short, your cabinets deserve a full wipe down every week with a quality disinfecting all-purpose cleaner, especially in the areas surrounding the handles. If you have grease build-up that won’t budge on fine wood cabinets, a wood-safe degreaser such as Goo Be Gone can work wonders. 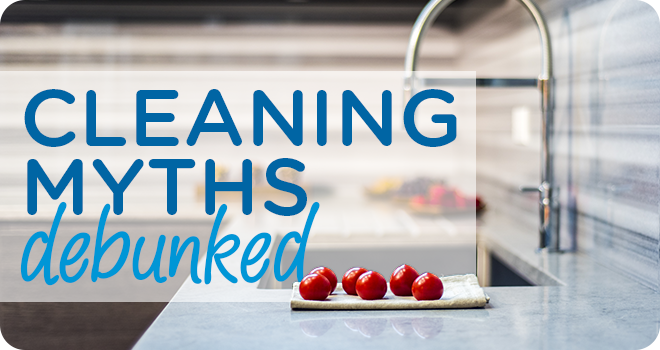 Myth #4 Quickly spraying and wiping countertops with disinfecting cleaners is good enough! FALSE Most people’s lack of knowledge when it comes to properly using disinfectants is a problem throughout the house but creates the most risk in the kitchen. Spraying and then immediately wiping off disinfecting cleaners is actually making your battle against the germs even harder. Almost all disinfectants need at least 60 seconds to sanitize and up to 10 minutes for full hospital-grade disinfection (as is clearly stated on the bottle that no one reads)! Removing a disinfectant instantly only kills off the very weakest of germs, leaving their beefy brethren to breed without competition. Disinfectant misuse, along with antibiotic misuse, is how we as a society are breeding stronger and more dangerous germs, commonly called super bugs. Don’t want to contribute to the next plague? Just remember to wipe down your counters but leave them damp with enough soap to remain wet for at least 60 seconds, though the longer the better. You can always dry off the excess later if need be, and that quick re-wipe is far better than the alternative.